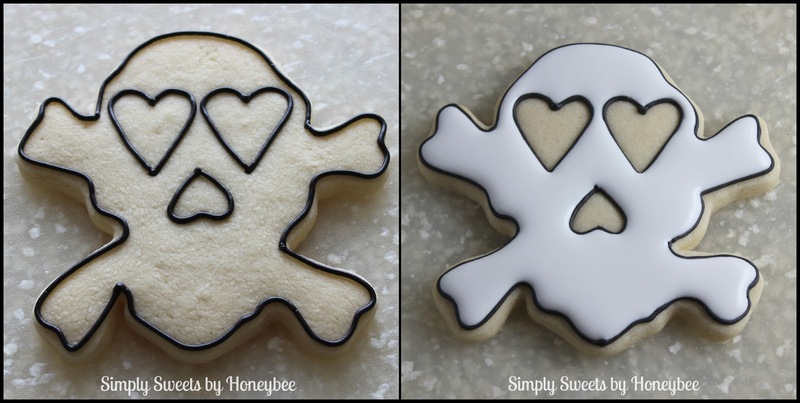 The skull & crossbone cookies are a simple design but I wanted to show you how they came together. 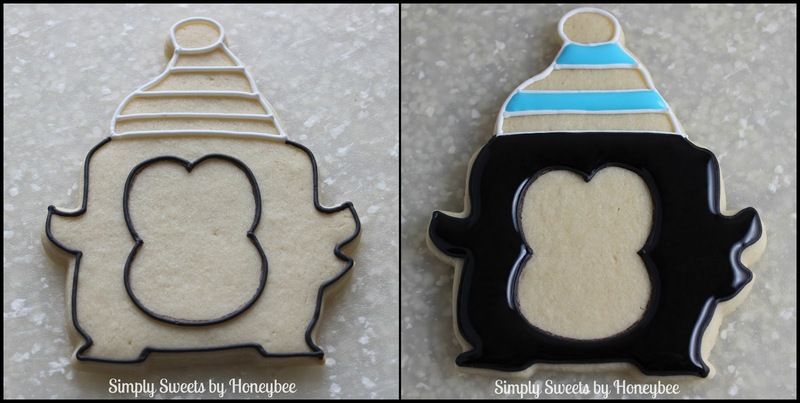 One of my favorite decorating techniques is using another cutter to make an impression on a cookie before you bake it. This leaves you guides for decorating. 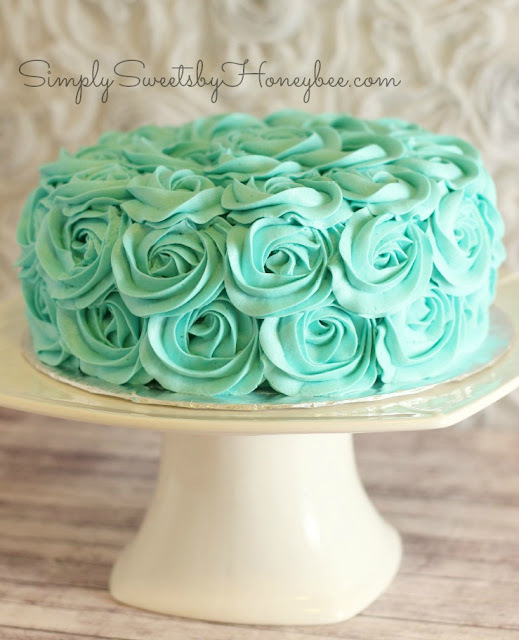 I learned this technique from the amazing Sugarbelle here. I used two different sizes of heart cutters to leave impressions of the eyes & nose on the cookies. 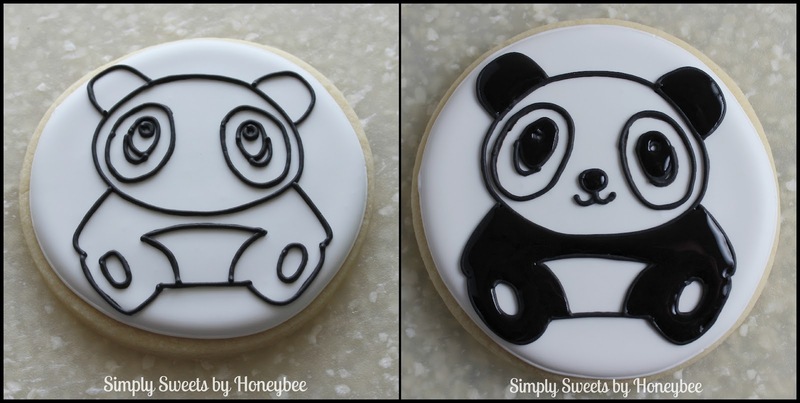 Next, I outlined the cookies with black piping consistency icing and allowed the outline to dry completely. Then I flooded the cookies with white flood consistency icing. To avoid bleeding I let the white dry for several hours before filling in the eyes & nose with black flood consistency icing. Finally, once the cookies were completely dry, I used a small paint brush and black gel food coloring to paint on eyelashes. I learned this technique for Sugarbelle here. My sister had to point out to me that I did not do a mouth on the cookies. This was done on purpose. I wanted the design to be all about the eyes and nose. 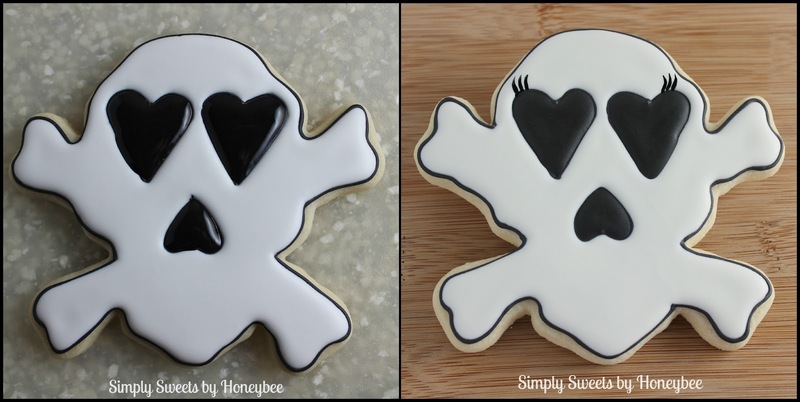 I wanted a girlie cookie without making it look like a Monster High cookie. I think the hearts and lashes gave me just the right amount of girlie. 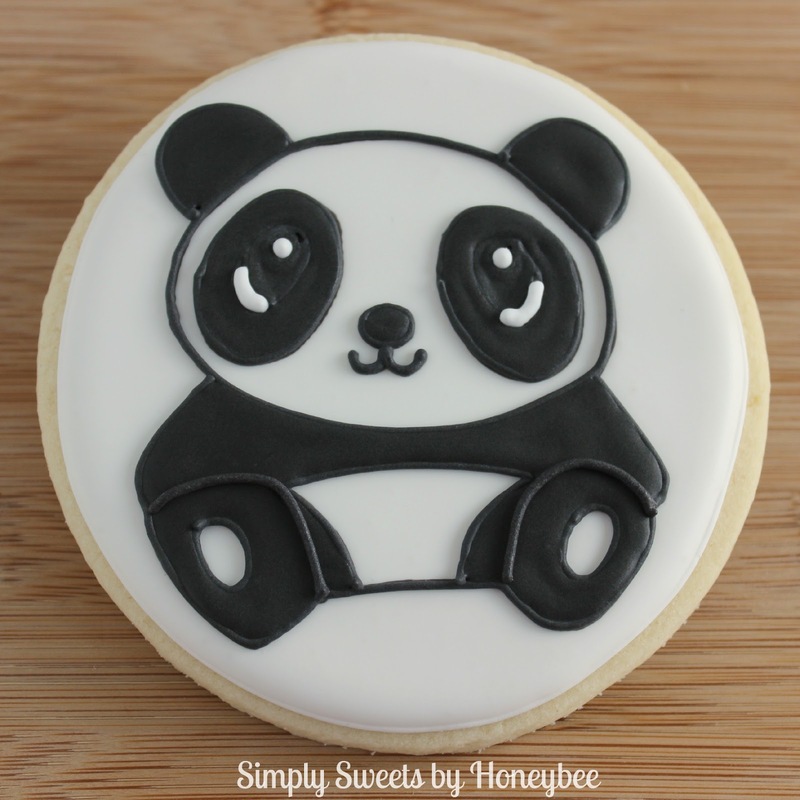 To make the panda cookies I started with cookies that had already been outlined & flooded white and were completely dry. 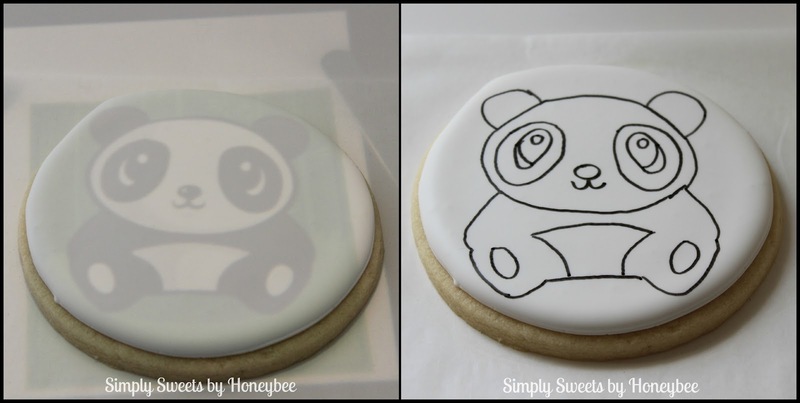 I used my Kopykake to trace an image I found online onto the cookies with a black edible marker. Next, I used black piping consistency icing and a #1.5 tip to go over the traced image. I allowed the outline to dry completely before filling in with black flood consistency icing. In hindsight, I did not like the way I did the eyes. The white spaces did not come out how I wanted them to because the areas were too small. I fixed the eyes by going back over the areas that should have been white with white piping consistency icing and a #1.5 tip. Then, I used black piping consistency icing and a #1.5 tip to add details to the feet. Mistakes can happen when you decorate but all that matters is how you fix them. I’m pleased with how the little guy came out. 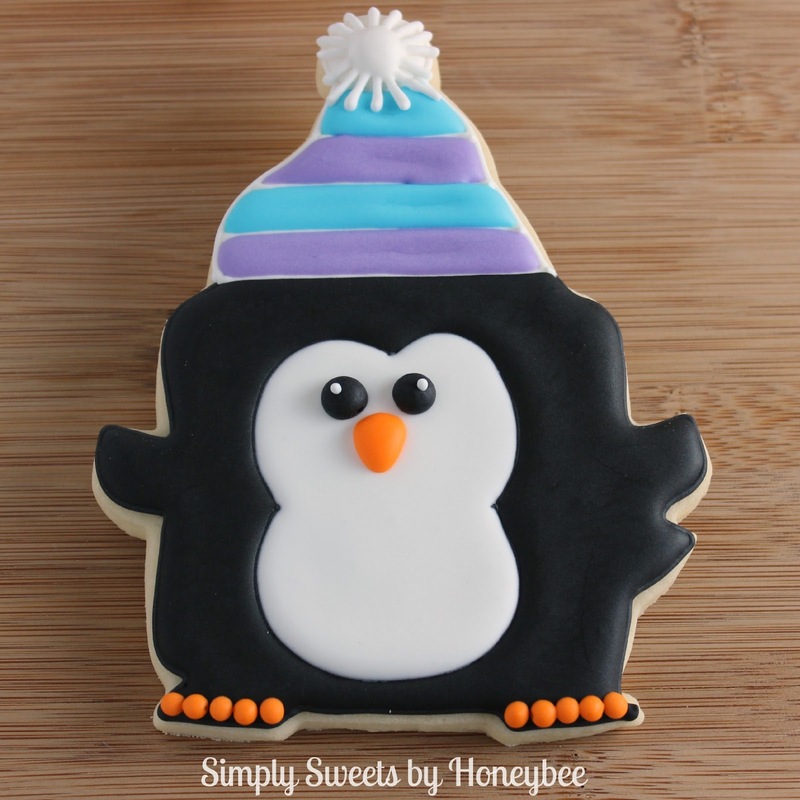 I won’t go into too much detail about the penguin cookies because they have been done before. My Valentine’s Day penguins were created after seeing this great tutorial by The Bearfoot Baker. I love this penguin cutter and it is the best 99 cents I have ever spent (got it on clearance at Michael’s Craft Store during Christmas). Who says a seasonal cutter has to only be for that particular season? These penguins made their way from being cold weather penguins all snuggled up in their hats & scarves (still my favorites Lisa) to Valentine’s penguins still wearing hats for the cold but finding warmth through love (I know cheesy). Now they are party penguins ready to celebrate a birthday. These could be baby shower penguins too with little beanies on. Just saying. Anyway I lost track. Let’s get back to the party penguins. The pictures below show you the steps I took to make the cookies. I’m not the best at free handing so I used an edible marker to mark the penguin’s belly. I found an image of a penguin that had a belly I liked and I projected it on the cookies with my Kopykake. 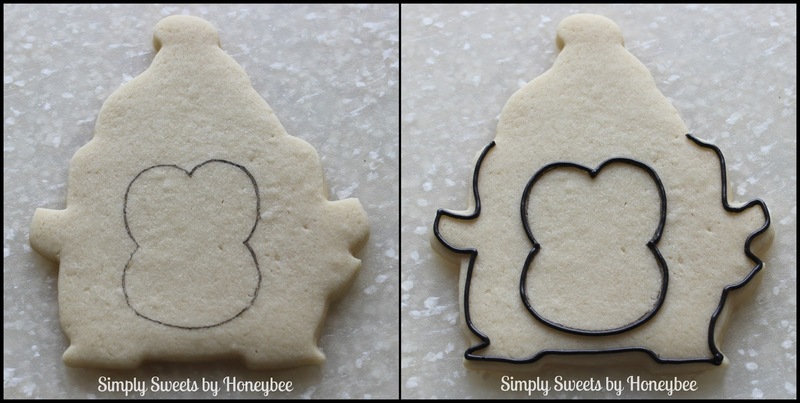 I outlined the cookies black and let the outline dry completely before adding the white outline. I allowed the white outline to dry completely before flooding the body and the hat. Finally, once the cookies were completely dry I added the streamer details on the top of the hat and the eyes, beak and feet. I did not intend to flood the feet black. This was an oopsie but I fixed it by piping the feet details on top of the black. Looks like I meant to do it that way all along. Thanks for stopping by today! I’ll see you again soon with another creation. These are all so stinkin cute Melissa! Awesome job! I am enjoying my scroll through your archived posts. These are too cute! You are very talented and skilled. I hope, with practice, I can be half as good. I don’t know so much about the imagination, though!! But, I’ll be happy with just the basics!